My article focuses on digital radio and especially on the financial part resulting from this upcoming development. The transition from analogue to digital broadcasting requires a huge investment cost in fixed assets. Since the end of 2012, we are going through the transition period where, theoretically, the radio can operate in parallel with analog and digital frequencies in a hybrid way. Of course in the above European directive there has been an extension due to the various difficulties arising in every European country. - Advantageous to Go Digital? - What new business ideas are generated? - The course of developments in other advanced countries? - Are listeners ready to accept digital broadcasting and to what extent? Based on the above, we can draw firm conclusions on the initiative of several European countries to adopt digital broadcasting; the main dilemma that arises is: if presented as promising why can’t it be embraced by the private sector and all initiatives so far come from state stations, where there is no public funding? The gap of knowledge is that at a regional level to live FM broadcasting, the 83% tuned in local R/ S (Research Focus Bari) will not be able to cope with the transition. Therefore, what should be done? speech (Goffman 1980). All the other distinctive traits, such as the nature of language and the way it is used by the listener and the producer emerge just from this blindness of it. On the radio, if we want to describe it in communicative terms, we distinguish the basic feature of the media: the transmitter can communicate simultaneously with a lot of receivers at a large distance. Flexibility is another characteristic of the radio. It allows the listener to engage in other activities while listening. In the past, radio was a group activity. The creation of smaller in size devices permitted the portability of the radio (Paulu 1981) and radio listening became a more solitary activity. The loneliness of the listener makes us confront with another paradox of the radio: while the audience is millions of people, the means addresses to each individual. In the past, the radio was grandiloquent and used to announce. always a very specific form of assessment consisting of three major elements: technology, content and audience. Radio often serves a critical role during a crisis. Today, people have a variety of technologies readily available that can deliver news nearly instantaneously. These technologies range from the most commonplace and affordable, such as television and radio, to the newest cutting edge technologies, such as Smartphone’s and tablets. Yet despite the amount of available information technologies, radio and television have remained vital to the public in times of crisis. Although television has taken over radio’s role as the primary crisis news source, radio has remained central to the public’s information seeking behavior both during and after crises. A crisis can create conditions in which television stations or other news outlets are directly affected (i.e., they were unable to broadcast or otherwise disseminate news). This is not an uncommon occurrence. For example, loss of electrical power more or less means loss of television broadcast. It is more difficult for a television station to continue broadcasting during a power outage than it is for a radio station. Battery powered radios are a fairly common household device. They exist commonly as alarm clocks; people have them for camping and other uses. Also, radios that can be operated on hand crank power are often marketed specifically for disaster preparedness. There are fewer options available in terms of alternative powered televisions. The mobility, technological simplicity, versatility, widespread availability, and inexpensive nature of radio make it a central component of a crisis communication system. Results from a recent national study of radio stations indicated that those in smaller markets indicated they were better prepared to handle a crisis, perceived a higher level of civic responsibility to report on crises, and they were more likely to believe that citizens would respond to a crisis or emergency in a pro-social manner. This is troubling, as radio stations in larger markets broadcast to more people, are often better funded, and can therefore help in disaster response and coordination. Moreover, if stations in larger markets are not broadcasting relevant crisis information, this means that large segments of the population may not receive vital information. A follow-up study was completed after the flooding along the Mississippi river in 2008. This study found that radio stations serving areas along the Mississippi river flood region perceived that they were prepared to serve the needs to the public in reaction to the flooding. Many of the stations indicated an ability to broadcast needed information, especially concerning severe weather and flooding, two common threats to the area. Most stations also indicated that the primary responsibility of the industry revolves around providing the public with needed information during the flooding. Stations also indicated participating in training and planning for potential crises, as well as a willingness to coordinate with public officials, health organizations and emergency managers. These investigations indicate that local radio plays a particularly critical role in a community-based response to a crisis. Disaster researchers often note that all disasters are local in their impact, and that the first response to a crisis comes from the community itself. Local radio stations, given their resilience, flexibility, and accessibility, play a critical role in informing the public, coordinating response, and reconstituting community connections. Moreover, the finding that smaller-market stations more fully understand and embrace that role is troubling. Regardless, a battery-powered or hand-crack radio is an essential part of an emergency preparedness kit. resilience, flexibility and accessibility, play a critical role in informing the public, coordinating response and reconstituting community connections. In a somewhat alarming turn, the replication of previous findings in the current investigation suggests that smaller-market stations more fully understand and embrace that role. It also suggests that in larger markets, radio stations may over-look this role, leaving much larger communities without the information necessary to protect life, health and property, as well as information related to the reduction of psychological stress and the empowerment of community resiliency efforts. content of crisis coverage. Attitudes of the public towards the crisis role of local radio are not clearly understood. affected by major crises and disasters. The transition to digital broadcasting requires high investment costs and the advent of the crisis in our country and for those who monitor developments in local media, the closure or suspension of operation of radio stations and journalists dismissals of technical and administrative personnel far from being a thunderbolt in the blue. In Greece and Europe, thousands of journalists have lost their jobs, while in the US thousands of their colleagues had the same fate. Large Greek SMEs, went into receivership and at regional level there are similar if not bigger problems because of the lack of government advertising. Local media cannot escape from the rule of the economic crisis. "Radio is the original form o f social media" meaning that it lets you connect with other people and transport ideas in the community or beyond it, for free; that's what makes it unique and the reason for its longevity. The terrestrial broadcasting grows bigger as well as the Internet and the online radio - the whole pie grows". A recent survey conducted by Nielsen found that the traditional radio broadcast is still the prominent in the US. According to the survey, almost two thirds (63%) of music lovers are coordinated through the (traditional) radio which remains the head of the discovery of new music. Of course, this only means that the trustworthy FM / MW sound remains an appreciable power, at least for the time being. "The accessibility of music has seen a tremendous expansion and diversification, "David Bakula, Director Development SVP development, Nielsen, explains. «Younger listeners choose some technologically advanced methods. There are so many ways to buy, consume and discover new music, it is not surprising that the consumer continues to access and enjoy music in greater numbers. " 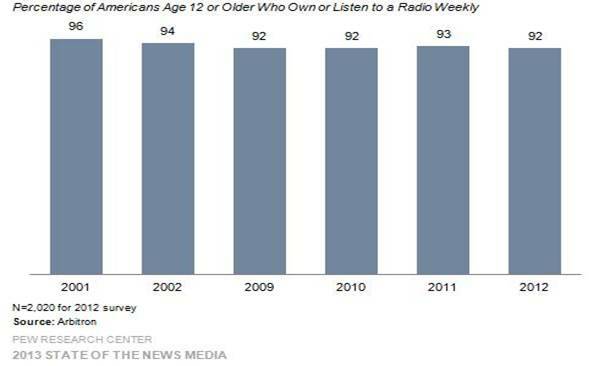 Research Center, 92% of the Americans aged twelve and older listen to the radio at least once a week, only 2% less than in 2002. In the meanwhile, Ofcom, the regulating body for telecommunications and broadcasting in the United Kingdom, has recently launched a digital radio report, revealing that consumers continue to buy more DAB (Digital Audio Broadcasting). Indeed, only one third (33.4% ) of all radio sets sold during the year until June 2013 was not a DAB tuner, although this was more than 28.7% in the previous year. Also, during the same period of these 12 months, about one third (33.9%) of total broadcasting hours was through digital radio, which includes DAB, digital television, internet and mobile apps. This represents an increase of 11.2% over the same period in 2010, an increase of 4.4% for the year 2012. Thus, DAB radio increases its market share in the UK, but still these listeners are even fewer than those in FM (a transmission technology that came in the spotlight in 1930). Roy Martin, founder and publisher of the national radio in the United Kingdom, explains the reason: "Traditional FM radio offers a reliable sound and has decades of historical listening behind it. Unlike television in the digital age, which offers dozens of channels, high definition TV and interactive services, Digital Radio does not offer enough extras to make people turn to it. Also, cars (the bulwark of radio-listening for decades) are worth examining. According to Ofcom, nearly two thirds (61.7%) of new cars are still not equipped with DAB radios as standard. While the UK television switchover from analogue to digital is complete, the future of radio is still uncertain. The country's action plan stipulates that any forced switchover will happen only when the market is ready for it, meaning when more than half of all listeners use the digital form and when the DAB coverage is at the same level with FM radio at national and local DAB coverage, covering the 90% of the UK population. Therefore, the radio may end up somewhere between the vinyl records and the movies. It is threatened by new and upcoming technologies. Things change ... just a little slower than some may have anticipated. Beginning from the dots and dashes, wireless telegraphy in the late 19th century through the first public broadcasts of the early 20th century and the algorithm, we reached this era, with radios existing everywhere from the FM to the WEB. But no one knows for sure what the future holds…? What exactly is the radio nowadays? It is out of focus and the lines between are blurred. For all intents and purposes, we can really say that digital radio (DAB ) and traditional (terrestrial) radio belong together in one category. Surely the quality may be better for digital, but both radios are practically the same. There is the interactive radio to the computer, Smartphone or tablet, allowing you to open a particular application and giving you control of the radio station, but actually it remains a "radio" to a degree that is attached to a linear transmission program. There is often the added benefit of being able to have catch-up content access, too. Popularized by the advent of the era of the iPod, podcasts usually offer episodic performances similar to how the radio broadcasts have been presented on air for decades. However, when all these can be downloaded on a portable media player, you can listen to any order you wish and they become part of your wider music and audiobook collection. Much like radio, Spotify, Deezer, Rdio etc, but it's all about access to property. In this case, however, you have to pay up to $ 9.99 per month to have access to the full collection. It is mainly for mobile use and for offline access. Close the SoundCloud, it behaves a bit like a subscription service, including also other types of audio, such as podcasts. It may also conflict with your intuition, and sites like YouTube, Vimeo, Vevo and everything else invade the radio land, too. YouTube can be a video site, but it can also be used as a radio-platform, allowing you to subscribe to other users. Spotify Radio allows you to select a kind of music and it will play tunes accordingly. You can also say what you like and in time it will learn and improve. Launched originally in 2002, Last.fm is really a kind of veteran online radio music. Similarly to Spotify Radio, a Last.fm user builds a profile of preferences, with details of the songs he listens to - both from Internet radio stations and his own music collection. Sirius XM Radio is one of the most popular satellite radio services, serving up dozens of music channels, sports, talks, comedies, news, traffic and more. It is available only in North America. SoundCloud is an online audio platform that allows you to record, upload and share your own music and podcasts. Indeed, this is used differently by different people; It is a great opportunity for networking and discovering new DJs, but it is equally good for the democratization of the broadcasting industry ... Anyone can be a DJ with SoundCloud. Launched in March 2009, Audioboo allows users to record an unlimited quota of creating a sound that can be shared with friends or shows in the world. They can also add images, titles and tags and be uploaded to Audioboo.fm complete, with biographical and geographical information about where and when it was recorded. TuneIn is a massively popular cross-platform service that allows you to browse and listen to thousands of radio stations, covering every kind of music, on-demand shows, podcasts, concerts and interviews. It is actually a search engine radio and audio-player in one device. It would be absurd to ignore the efforts of Apple in this field. Surely, iTunes itself brought pretty much the podcasting revolution, but Radio iTunes has recently started and it could be proved to be a major contender to win a large share of the market (at least in the US). It offers a number of stations and it focuses on different kinds of music, depending on the seasons. But you can also create your own stations, using only songs, artists or kinds of music. Yes, it can be a bit like Pandora or Last.fm, but the iTunes Radio has the power of Apple. The BBC innovations can largely be concentrated in the United Kingdom but it is an organization worth noting, having spent huge funds and time in research and development in the field of digital technology. Now, the BBC program Audio Research Parnership runs, which gathered a plethora of leading experts sound for a research partnership of five years. Last year, it also launched a new innovation, the iPlayer app radio, while only two months ago, it started Playlister, a service that allows users to store the songs which are played, just the moment when they hear them online or in-app , and to transport them to other services such as Spotify, Deezer and YouTube. But why exactly cannot the radio prevail? A further reference to what exactly is DAB +, how we got to initially select DAB and then recommend the DAB + and what happens in other countries. and Comparison between the traditional analog radio and the digital model. research institutes, service lanes and electronics companies and the World Dab Forum (www.worlddabforum.org), which all together contributed to the birthplace of technology and services that up to now is the Old Continent, without other regions such as Canada, Asia, South Africa, Australia, which are now on trial phase of the DAB +, falling short. Today there are worldwide more than 300 million people who can have access to more than 600 services DAB. Believing that the subject of my diploma thesis is special and specialized knowledge is required by the readers I will try in every step to take photographs in an attempt for my opinions and the general references of specialists to be understood. In the picture above, the main differences between analog and digital transmitter can be identified. The main difference (which will also affect the listeners) is the moving to megacycle, meaning that we should move from the traditional band of 87.5 and 108 up to 174 up to 240 megacycles. This may sound easy in terms of transmitter (radio station ), but it is quite difficult in terms of receiver (listener). DAB always selects the optimal "path" so as to reach the signal receiver. There are no parasites, pauses or stereo and mono receptions. The sound quality is high, compared to the FM, thanks to its digital transmission. The sound is compressed by the standard MPEG1 Audio Layer II. Those who have experienced the MP3 music format files, can understand better the quality of the sound which, in the case of DAB, can be started from 128kbps and even touch 320kbps (CD quality). Also, it provides six subfrequencies in case of DAB and 15 in case of DAB + (it is the most sophisticated form of DAB). The above means that through a transmitter many more stations or a station with different programs or themes can be broadcasted. These 4 elements are the main that any administration Radio Station concerns about. Everything else is of less importance, such as studies, environmental conditions, approval of the Civil Aviation Authority, the Approvals of the Atomic Energy Commission, emissions radiation / pollutants licensed premises, licensed transmitting antenna / receiving / relay. However, in each case, they will be equivalent in both occasions. The research will be following the study of the American Telecommunication Commission (Federal Communications Commission) in conjunction with the American Broadcasting UK company and I will present you, in comparison, the costs for each one. Assuming (based on the average of 15 radio stations per Prefecture , lists of which I own by the E.S.R.) I will present the corresponding costs, meaning Analog radio Vs Digital radio. To make myself clear, if for example the town of Kozani has 15 radio stations, what are the costs as analog and what is the benefit if they change into digital. Analyzing the 4 parameters, we can start from the investment cost. It is clear that the investment cost is 6 times lower in the case of digital transmission. 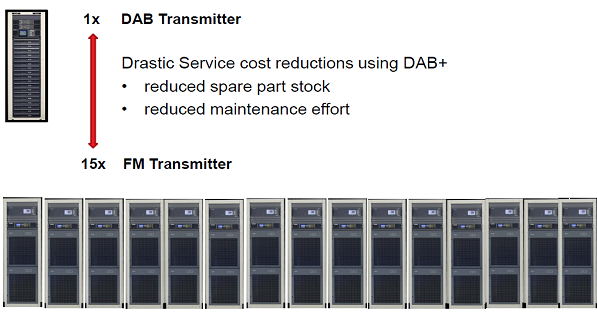 If someone considers the whole cost of antenna systems needed for 15 radio stations to be set up as opposed to a single antenna system which the transmitter DAB needs, we can all realize that the cost drops. The problem which arises is that usually the different radio stations usually belong to different owners and as we can understand it is very difficult – not to say impossible – to come to a joint agreement to invest together .The possibilities of each organization are different and that’s why, as in Digital TV happens, an only provider is usually licensed by the state and then creates the technical infrastructure and leases frequencies to the various broadcasters. Something similar should be done in the field of digital radio, since after the competition launched by the National Telecommunications and Post for digital frequencies only DEGIA was licensed (it was the only company that took part in the competition). In my thesis I will focus on the operational costs since it is an integral part of the media survival during the difficult times we live. A very important operating cost functional for the radio broadcasting companies is the electricity. We all try to minimize our electricity needs. 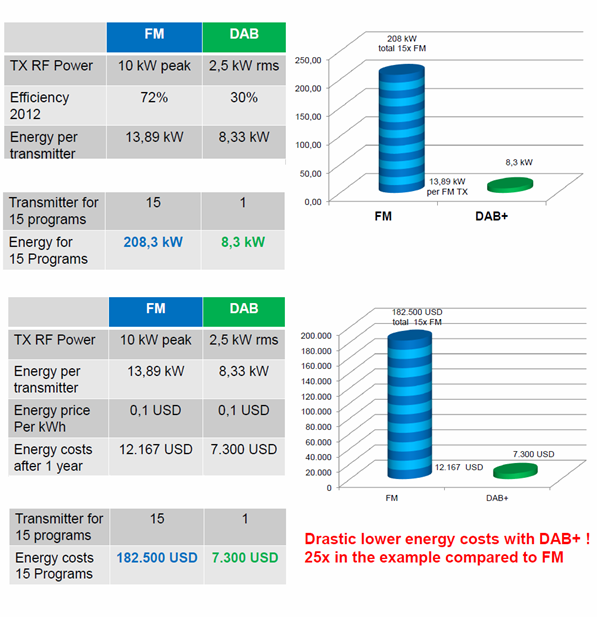 In the table below we see that the total spending energy is 25 times smaller in the case of digital broadcasting of 15 radio stations from a transmitter DAB + in relation to the individual transmitting of 15 analog radio stations. In 10 years time, the total beneficial gain from the drastic reduction of energy consumption will be huge, 56,000 Euros against 1.4 million Euros needed now for the analogue transmission. Based on our experience, I believe that in order to make the investment possible for the local radio stations, all of them should be united. For example, in Athens, which has 60 stations, 4 groups should be done and 4 transmitters should be purchased. In Kozani, two transmitters are needed for 30 stations. Otherwise, all stations will be wiped out, because so far the cost is too high for the province and there is no room for individual cost reduction. An important role is played by the exploitation of space, but again much less space is required to digital broadcasting, as shown in the table below. Also, because of the large reduction of the required emission machines and the use of a single transmitter, reduced maintenance costs of the machinery and of the antenna systems occur. 15 transmitters and antennas 15 clearly need much higher maintenance costs than a transmitter and an antenna need. The transition to digital broadcasting will bring about radical changes mainly in the acquisition cost of receivers, because, besides the owners of the radio stations, the listeners will be obliged to replace their devices, too. Except for the American market, in all other countries, the purchase of a digital receiver remains costly because there is not yet a mass production to reduce costs and to enjoy scale economies. The launch of digital radio in Germany is supported by leading manufacturers of Europe and the whole world. Manufacturers like PURE, SONY, Philips, Roberts, Panasonic, Enspert, DUAL, Tivoli and others have committed to introduce to the market a wide range of receivers, ensuring that all market categories and all budgets have the product which perfectly meets their needs. In line with the launch of digital radio, two large chains of stores selling electronics, namely Saturn and Media Markt pledged to dispose a sufficient number of receivers. Great Britain appears to be wary, with the Culture Minister Helen Goodman warning the government not to make hasty moves in reference to the transition because it would hurt poor households. "Given the cost of living crisis indirectly, it is not the right time for someone to force the majority of people in this country to spend 50 or more pounds to purchase a new digital radio," said Goodman. "Pressing in such a direction, while everyone's budgets are tight, it's just another example of the government ministers who listen to companies and people running technology companies, without being in touch with ordinary people. The socio-economic dimension shows that people with low incomes are less likely to use digital radio than people with higher incomes, so the cost falls disproportionately on people with lower incomes. " The private association radio operators, Radio Centre, hopes to complete the transition by 2018, three years later than it had been given as controversial date in 2015. However, a consortium of 80 commercial stations, which meanwhile rose to 100, expressed its opposition to the move earlier in November, arguing that the move would endanger the local radio and would cost each household "several hundred pounds." The digital assimilation has not been as fast as it was once expected, with 35.6% of all listening by digital platforms, around two thirds of the percentage of radio DAB. Coverage DAB falls well short of the analogue radio via FM and AM and it remains unclear how it will finance the future installation of transmitters DAB. When the Labour Party was still in government in 2009, it was said that the two-year plan of digital radio switchover will not start until at least 50% of the hearing happens via a digital platform. The Goodman company suggested that this must rise to at least 75% of the hearing before any transition target is set, with 50% of the hearing being via DAB. The Goodman said: "We know that less than 20% of the radios used is digital and only the fourth listening to the radio is radio with digital audio broadcasting (DAB). There is also a particular problem for cars". In Britain, there are people who raise discussion regarding the digital radio broadcasting system and how much better the selection system that would allow the implementation of the transition to the digital world in phases, with the gradual replacement of available FM services, would be. National, Regional and local stations, but also the Community Schools in the United Kingdom would have the opportunity to stem the concerns of listeners. The worst is the feeling that some have about being forced to fit in a multiplex DAB (DAB multiplex). In addition, the cost of attending multiplexers may discourage many smaller stations of England, on the grounds that the coverage of the multiplexer is much poorer in terms of audience base, but also the expectations of advertisers. Many concerns are now expressed in England regarding any potential non-advantageous, or absent emission capability of smaller private and community stations, or non cost-emission, in fear of a vital mixture of multifarious radio content being put at risk. Concerns that smaller stations may lack over larger stations, of which designed the DAB system in the UK, has not abated, despite the repeated reassurances by the authorities. It is an issue that the DAB system was designed in a vertical manner in order to meet the needs primarilyof large stations in Europe, having in mind the options and listening habits of ordinary people, some claim in the United Kingdom. The fact is that the DAB multiplex offers a great solution to Radio, similar to Digital TV. For now, in Britain and elsewhere, listeners are tuned to some favorite radio stations and not by constantly zapping at various multiplexes, as it was happening on TV until interesting new shapes emerged. Listeners in Britain want the diversity of available radio programs, but generally adhere to some beloved ones that match their tastes. For some British citizens there is the paradox of the organization of radio programming to large multiplexes, with the option of listeners to fall between a few large public and private stations. According to John Shaw, Chairman of ITU-R Working Party 6A Rapporteur Group fortunately, over time, it appeared a single European solution to overcome the limitations of the system DAB. This is the DRM +, the latest evolution in the family forms of coding and emission DRM. The broadcast in DRM + was developed to replace the analog radio broadcast in the areas of VHF, while remaining compatible with the strict planning of broadcast regions in Europe. 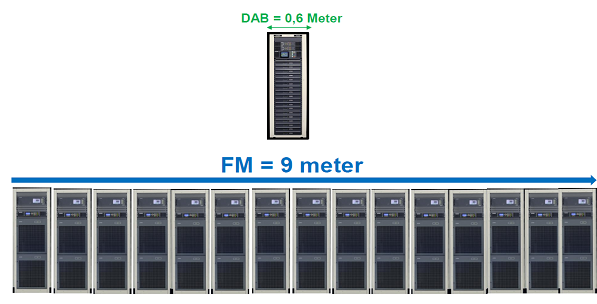 Initially the DRM + intended to replace FM broadcasts in band II, the VHF (87.5-108 MHz). However, successful tests of DRM + (Scotland, Edinburgh, Rome Italy and elsewhere) in Banda II led to the consideration of its use for providing new broadcast opportunities in Band I (47-72 MHz) and Band III (174-230 MHz). And now it is clear that the organization of the digital switchover of radio emission in phases will provide the easiest way, but also the time required so that the FM stations will be transformed into capable for DRM + stations that will be able to have the initial coverage of their area, similar to FM, without many transponders, regardless of whether they are smaller or larger stations, which cannot be achieved by the DAB. The new radio technology, which according to the intentions of the state will move along with the procedures for digital television, will create a new reality for most radio central businesses and for the vast majority of businesses in the region. The digital radio broadcast requires new investments by the radio business, while the consumer should put his hand in his pocket given the need to purchase new radio receivers (home, car). The listener-receiver uses either DAB receivers incorporated in radio / CD car or on desktop and mobile devices to receive the transmitted audio signal and the information. The replacement costs remain high and listeners will be forced to pay a lot of money. Of course, it is estimated that, with the continuous increasing demand, prices will be reduced because of the large supply. Certainly, prices will vary depending on the device because the DAB + technology with the use of digital technology, offers possibilities which are unlimited and can be combined even with special navigation system that helps drivers on road unlike traditional analog transmitters where they could enter up to eight characters (RDS). In the study, conducted by the Office of Strategic Intelligence of the EBU (SIS) and was presented in Geneva at the Conference on Digital Radio, experts discuss about means and platforms available and the expectations and limitations resulting from the digitization of radio. The main conclusion of the study is that public radio is at the forefront of the development of digital radio and in a critical position for the adoption and success of technologies DAB / DAB + and DRM. Of course, this time, the removal from analogue broadcasting is not foreseen on the horizon, and it will take more than a decade until it becomes a realistic prospect. There are indications that FM will remain after 2020 in many markets .The study also highlights the fact that without a dedicated broadcast network, the radio can be displaced by other platforms, where television and other services predominates. Radio stations can actually lose their identities if they constitute complementary capabilities to centralized services that control menus, electronic program and the technical parameters of broadcast drivers. 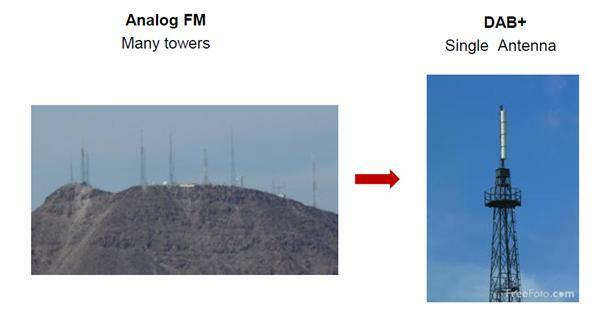 A very important advantage is the space saving and the environmental arranging arbitrary installations in mountains, since the DAB + system requires only one antenna system unlike analog broadcasting where each radio transmitter requires its own antenna (no possibility of dual emission from an antenna system but requires special conditions and long distance between the PLL that is emitting the frequency and excessive costs of creation. While so many years we were talking about the notorious antenna farms, which in most regions there is still spatial determination of the exact location, most would not put such a restriction because the installation of a single antenna can be erected anywhere appropriate. Radio stations can be a geographical coverage of the region and not necessarily only local coverage. In the transition stage from analogue to digital radio, listeners of terrestrial are confronted with questions and dilemmas. The new possibilities offered by digital radio (better sound quality, more channel choices, greater access and flexibility of use) create uncertainty in Europe that seeks the best possible model for users. The media are gradually changing their character in the digital era compared to analog. The potential that the citizen has to choose by himself what he wants to see or hear (model "pull") - whenever he wants (on demand), effectively renders the older model, where a printed means or a broadcaster publishes in predetermined times the analog content, obsolete. Generally, the version where the user requests content instead of the version where the informative or entertainment means "pushes" some content, brings a small revolution to the quality of information / entertainment material, too. Where previously the means massively targeted to an average, more content can be fully qualified to meet the specific needs of people. On the other hand, broadcast media are trying to "reconcile" the information by estimating an average of viewers’ interest. But, in the digital era, information and entertainment will be by "mass-customization" in which all viewers will seek for specialized content that interests them. In this part, the contribution of the digital content production is probably crucial to leverage new capabilities to the fullest. On this matter, only the digitization of analogue material or creating digital material based production principles as those applicable to the analog era is not enough; we need to create material that covers multiple specialized interests. As understood from the above, in the last years particular emphasis on the technology of the medium was given, but the other two elements, content and listeners, were neglected. Since, at least theoretically, we conclude to a common technology platform, even if this causes some to move at two speeds. - Hoeg, W., (2009) “Digital Audio Broadcasting DAB+ ” 3[rd] Edition , Wiley . - Joseph Turow (1997) , “ media systems society ” USA ,LONGMAN Second edition . - Hendy, D., ( 2013) “Radio in the global age”. John Wiley & Sons . - Crisell, A. (1986). “ Understanding Radio ” ,London: Routledge. Communication studies: an introductory reader . London: E. Arnold. - Paulu, B. (1981). “Television and Radio in the United Kingdom”. - Silvey, R.(1974). “ Who’s Listening? ” London: George Allen & Unwin. - Hoeg , W., Lauterbach , T.,(2001 ) “ Digital Audio Broadcasting: Principles and Applications” , John Wiley & Sons, Ltd, Published Online: 2 APR 2002 . - Papazisis.Psychogiopoulou, E., and Kandyla, A. (2013) "Media policy-making in Greece: Lessons from digital terrestrial television and the restructuring of public service broadcasting. "International Journal of Media & Cultural Politics 9.2 (2013). - Baltzis, A, and Christos Barboutis. (2013) "Doubt is in the Air." Modeling the Comparison Between Traditional and Web Casting Radio on the Greek Case. "Journal of Radio & Audio Media 20.1 (2013): 53-67. - Bourdena, Athina, (2012) "A radio resource management framework for TVWS exploitation under the RTSSM policy. ", 2012 International Conference on. IEEE, 2012. - Papathanasopoulos, Stelios (1997) "The power of television, the logic of the medium and the market", Athens: Routledge. - Media Data "Statistics for Greek SMEs' Access Date 04/03/2014 at: http://www2.media.uoa.gr/mediadata/index.php?l=gr&c=radio. - National Radio and Television Council (2014), Access Date 02/28/2014 at http://www.esr.gr "terrestrial broadcasting"http://www.esr.gr/arxeion-xml/pages/esr/esrSite/view?section=e5f2 cfb3c0aa1e7683571826e98263e5&categ=11031aafd0871e7683571826e98263e5&last_clicked_id=link4 . - National Telecommunications and Post (2014), Access Date 19/02/2013 at http://www.eett.gr "(Government Gazette 161 / A /2007)"http://www.eett.gr/opencms/opencms/EETT/Electronic_Communications/Radio_Communications/Monitoring/N3592_2007.html . - Board member and Secretary of the Regional Council of Research and Innovation of Western Macedonia.